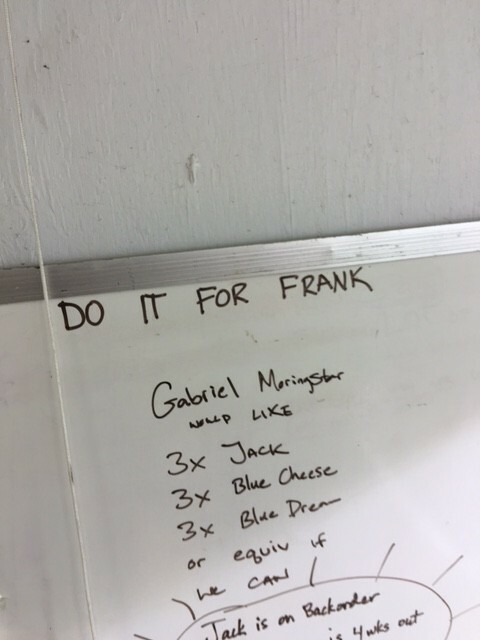 Walking into one of the grow rooms on Adam Jacques’ farm outside of Eugene, Oregon, you will find dozens of cannabis plants and a whiteboard on the wall with the note “Do it for Frank” across the top. This is a reminder of why Jacques and his team are growing medical marijuana: To help people. 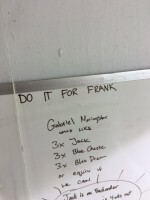 Frank Leeds, one of Jacques’ cannabis patients, lost his battle with cancer in early January. 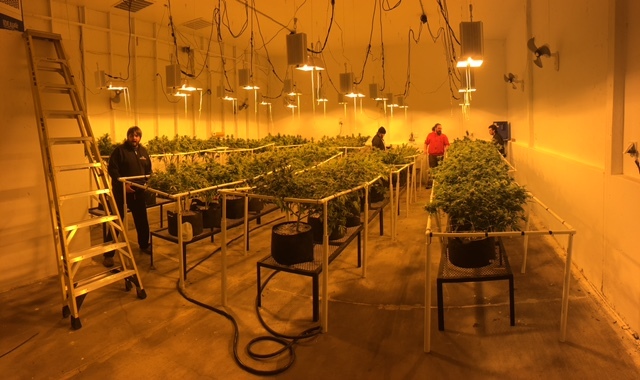 A view of the grow room where they have 48 plants in flowering..
Jacques was working with Frank for the past five years to develop “Frank’s Gift,” a high-cannabidiol (CBD) strain with a slew of potential medical benefits. Deeply saddened by the loss of his patient and close friend, Jacques continues to run his grow operation, Grower’s Guild Gardens, where he and his wife, Debra, work to get high-quality, safe medicine to their patients. His patients and other publications have repeatedly referred to Jacques as a “legend.” Jacques previously won Canna Magazine’s award for Most Influential Grower in the Northwest. 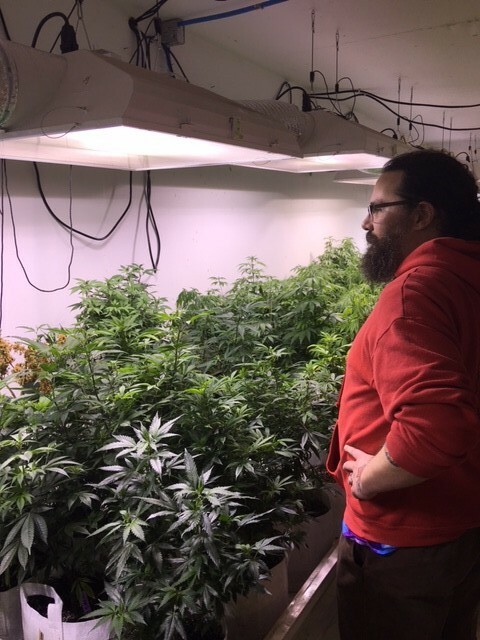 Adam Jacques looking over his plants in their vegetative stage. On their farm, strain testing is currently underway for the upcoming changes in the recreational program in Oregon. “With the way the medical laws are now, I have 48 plants for my patients, including multiple high-CBD genetics, and any excess flower will be sold to recreational dispensaries to cover our overhead costs,” says Jacques. 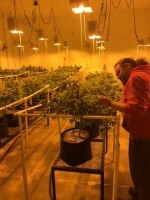 When the Oregon Liquor Control Commission (OLCC) grants them their recreational grow license, he will take some of those trial strains to an outdoor crop estimated to be in the thousands of plants on his 42-acre farm. Presenting at the Dispensary Next Conference a few weeks ago, Jacques said to a crowded room of industry professionals: “The biggest reward is helping people.” Jacques and his team’s work exemplifies the good that smaller grow operations can do for the industry. 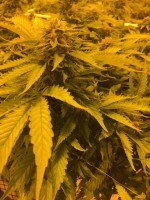 This plant is roughly four weeks from harvest, currently in the flowering stage. Jacques’ recent work has taken him to help Leni Young, a four-year-old girl originally from Alabama who suffers from debilitating seizures. Her parents became medical refugees when she was not selected for an Alabama study involving cannabis oil. 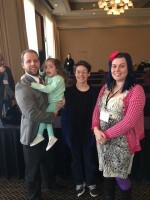 As a result, the Young’s took their daughter to Eugene, where with the help of Jacques and his team, they could get her customized cannabis oil with high doses of CBD and tetrahydrocannabinolic acid (THC-A) that could help treat her seizures. Left to right: Wayne Young with his daughter, Leni Young, and son, Thomas Young, alongside Debra Jacques. The cannabis oil that Jacques created has brought Young’s seizures down from multiple occurring every day to just one every six weeks. “One-strain solutions like ‘Charlotte’s Web’ are no longer the answer for treating medical conditions,” says Jacques. “We create something custom designed for individual patients, and it is working.” CBD and THC-A, the main active ingredients in Leni’s medicine, are two of the non-psychoactive compounds in cannabis believed to have extraordinary medical benefits. 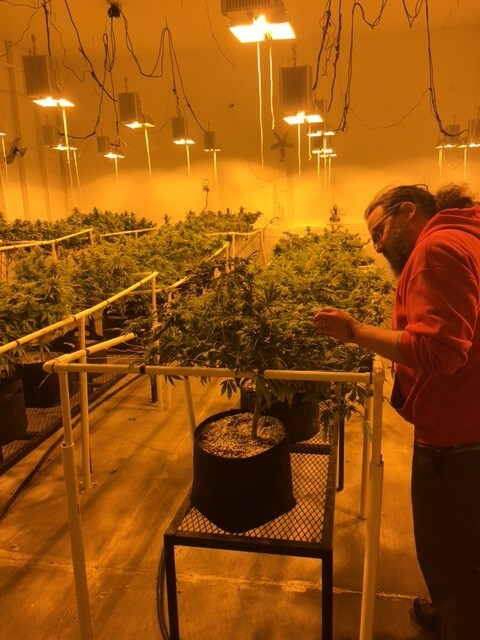 Jacques inspecting some of the different strains they are testing for the recreational program. Jacques and his team represent the idea that embodies the cannabis legalization movement, which is to help people get the medicine they need. “The money is not really important any more,” says Jacques.